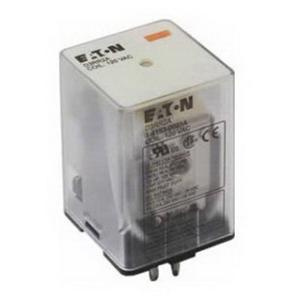 Eaton 2-Pole 8-Pin octal general-purpose plug-in relay is rated at 10-Amps and 300-Volt AC. It has coil rating of 120-Volt AC. DPDT Contact configuration relay features silver alloy construction. Flag indicator shows relay status in manual or powered condition. Push-to-Test button allows for manual operation of relay and easily checks contact operation. This relay has 1700-Ohm coil resistance and supports plug-in mounting. Relay is UL/cRUus listed, CSA/CE certified and RoHS compliant.